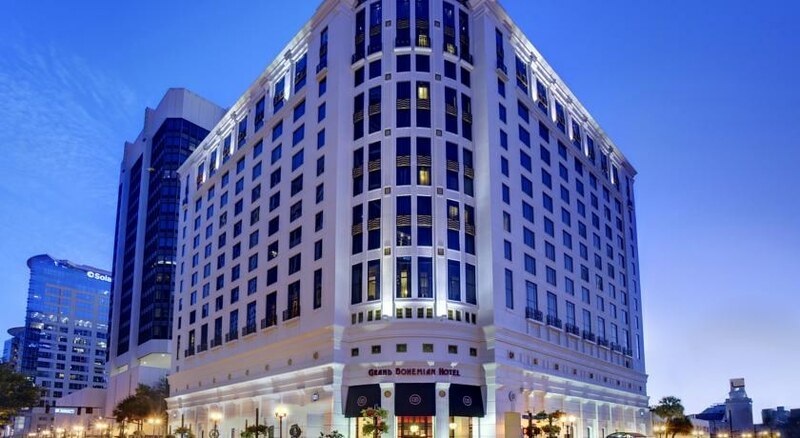 Celebrated as an experience in art and music, the AAA Four Diamond Grand Bohemian Hotel takes center stage as downtown Orlando's landmark luxury hotel. 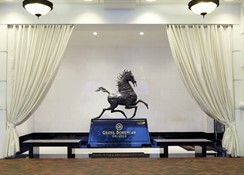 From the moment of arrival, guests experience a dazzling blend of art, music and memorable hospitality. Italian mosaic tiled barrel-vaulted ceilings welcome you into an oasis of sheer beauty, housing an unprecedented collection of over 150 rare works of art. 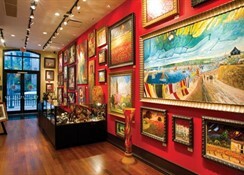 You will be just moments from downtown's cultural gems as well as Orlando's magical theme parks. Discover a setting that celebrates creativity and inspires the soul. The 6th-floor pool deck houses a lap pool and an all-white- fabric-draped gazebo containing five glass and wrought-iron chandeliers. Sun loungers and parasols are laid out ready for use- and guests may enjoy a massage for an additional surcharge. A short flight of stairs leads from the deck down to the Bohemian Gardens- a secluded area with tables. The hotel has a complimentary gym available 24 hours a day. A DJ plays on Friday and Saturday nights following jazz sessions in the bar.MealsThe hotel has a restaurant on-site. Breakfast is served each morning- and lunch and dinner may be enjoyed à la carte or from a set menu. The bar- offering drinks and appetisers- features piano music nightly and looks out onto City Hall. Our Concierge Level Guestrooms, located on the exclusive 14th and 15th floors, offer stunning views of downtown Orlando and evening turndown service, as well as complimentary continental breakfast buffet in our Concierge Lounge, served Monday through Friday from 6:30a - 9:30a. 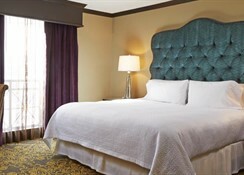 All of the Grand Bohemian Hotel’s guestrooms feature a luxurious environment of lush velvet drapes, custom Java wood furniture, 6–foot headboards, and all-white pillowtop beds. The spacious seating and desk area offer generous work space, and a marble-appointed bathroom features a shower/tub combination, telephone, and custom bath amenities. Jacuzzi suites offer additional square footage consisting of a separate living/dining area with a second television and a sofabed. 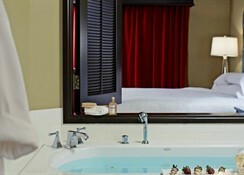 The feature amenity of these suites is a large Jacuzzi whirlpool tub in the bathroom opening up into the bedroom. A separate shower is also present. 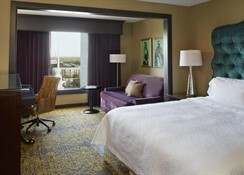 Grand Bohemian Orlando Suites offer stunning views of downtown Orlando and evening turndown service upon request. 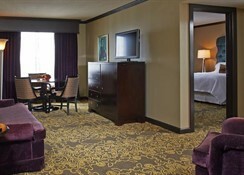 Suites feature added amenities to the standard guestrooms, including more square footage, a separate living/dining area with a second television and a sofabed. The edgy and intriguing Bösendorfer Lounge is a favorite local hot spot, proven to be the best place to sip wine and enjoy the sounds of the Imperial Grand Bösendorfer Piano, one of only a handful in the world. Guests enjoy live entertainment and signature dishes while being surrounded by striking art and captivating surroundings. Every Friday and Saturday night, Lounge visitors enjoy classic soul, soothing jazz music, unique handcrafted cocktails and gourmet indulgences. When you’re hungry for an exceptional dining experience in downtown Orlando, The Boheme restaurant is sure to satisfy. From edgy-chic decor to sparkling service and eclectic menus, a meal at The Boheme restaurant will be one you will never forget.